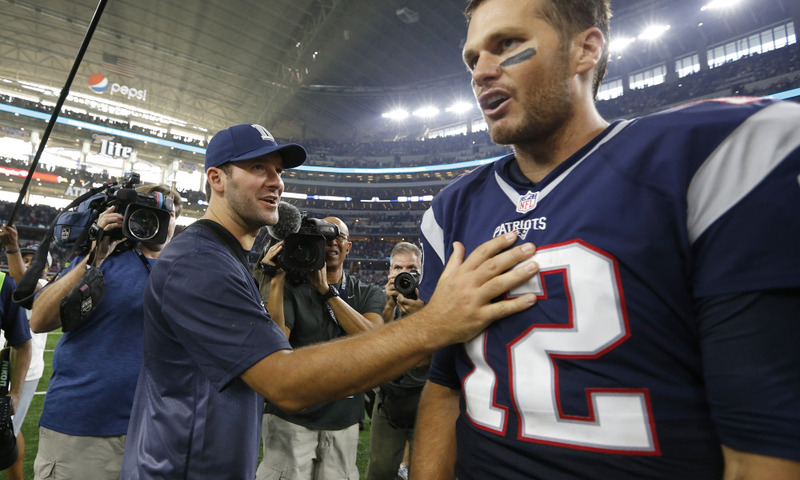 Tony Romo to Tom Brady: "See you in February"
Tony Romo didn't play Sunday against the Patriots due to his broken left clavicle, but it didn't stop him from making a bold-as-hell proclamation to fellow QB Tom Brady: see you in Santa Clara. "Good luck, man," said Brady. "Hope you feel better." "See you in February," Romo replied. Pats vs. Cowboys for all the marbles in Super Bowl 50? Now, there's nothing wrong with athletes being confident in their abilities and believing in their aspirations, but maybe the medical staff gave Romo a higher dosage of painkillers than normal on Sunday afternoon.